In this video, you will learn how to convert a RadPanelBar to the new RadPageView control introduced in the R2 2010 release of RadControls for WinForms. In this video, you will learn how to convert a RadTabStrip to the new RadPageView control introduced in the R2 2010 release of RadControls for WinForms. 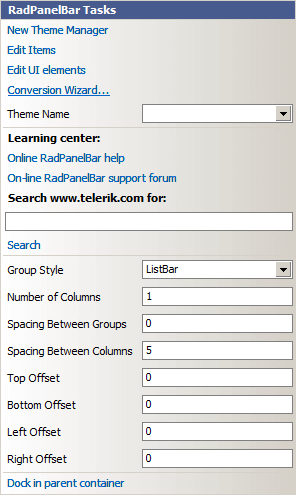 This article is valid for Telerik UI for WinForms versions prior to R2 2011 SP1 version inclusive. The Upgrade Tool can be used only if started from the Smart Tag of the obsolete controls. Since these controls have been removed in R3 2011 version, their respective Upgrade Tools are not available as well. In case you want to use the tools, please upgrade/downgrade to R2 2011 SP1 (v2011.2.11.831) version. RadPageView- successor of RadTabStrip and RadPanelBar. RadListControl - successor of RadListBox. RadDropDownList - successor of RadComboBox. 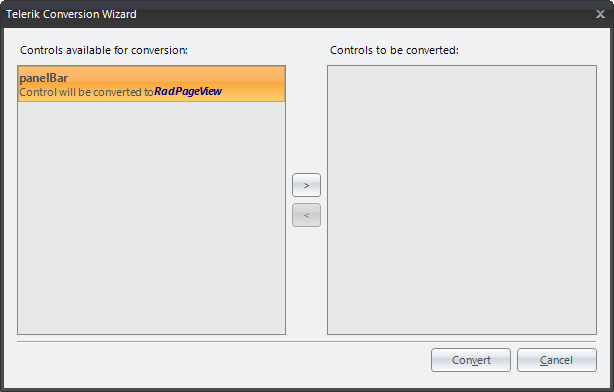 The “Conversion Wizard…” command will open the wizard dialog. On the left side are listed all the controls, available for conversion, while on the right side are all the controls that will be actually converted. The two lists can be organized using the buttons in the middle. Upon loading, the tool will loop through all the components registered with the current design surface and will populate the ones that may be converted to newer controls. All the controls that will be converted should be put in the right list and the Convert button should be clicked. RadPageView does not support adding elements directly to a RadPageViewPage. Hence, a conversion from RadPanelBar will create empty pages for element-based groups; only groups that are used as control hosts will be completely converted. Old controls will be DELETED upon conversion, so make sure that you have backed-up your projects first. Events are not converted. When you convert an obsolete control, your event handler methods will remain intact, but it is important to note that the event subscriptions will be cleared.